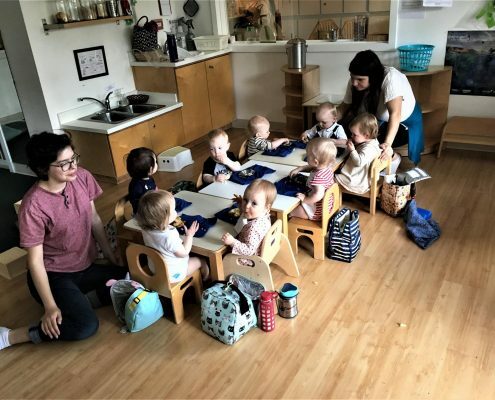 The mission of Montessori of Alameda is to provide a bi-lingual Spanish and English Montessori experience for children birth to Kindergarten in Portland, Oregon. Montessori of Alameda strives to provide a child centered educational environment. Montessori of Alameda respects each child as an individual. Encourages initiative and choice fostering academic excellence. Has a carefully prepared environment where the child is free to choose. Models grace and courtesy and respect for others. Adhering to current research in Montessori philosophy as defined by the American Montessori Society. Encouraging cultural and ethnic diversity as well as respect for the individual. Observing each child to prepare an environment that meets each individual child’s needs. Fostering involvement with parents, teachers, students and the larger community. Maintaining a positive work environment for our staff and supporting continuing education for our employees. Maria Montessori developed her educational approach based on the strong belief that childhood is an exceptional and delicate time of self-construction, when the child actively explores their world and assimilates what they have learned into their entire being. Experiences not only shape what we know but who we are. She saw an amazing potential in the human being to use our brain more fully and achieve a higher level of understanding, consciousness, and peace in our lives. And childhood is the time in which it is possible to tap into these latent possibilities. We as educators, and more simply as people who love children and have the opportunity to observe them in an environment carefully prepared just for them, share this belief. This perspective on the human potential shapes not only our outlook on children but on life in general. We are Montessorians. 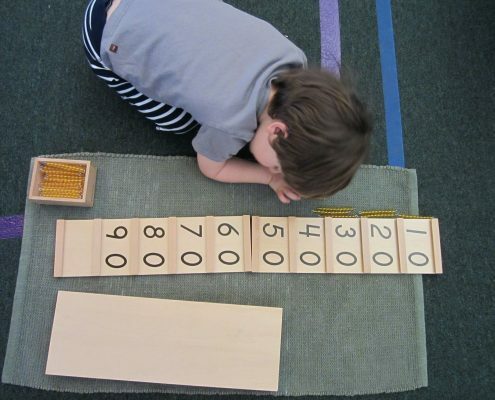 We do not simply “do” Montessori. We see the Montessori Method as an education for life and our roles as guides of children at Montessori of Alameda as our life’s work. Though we do care for children while their parents work, we see ourselves as much more than simply providing “child care”. Our goal is to create environments and provide experiences that offer children the opportunity to master their physical bodies; their physical, intellectual, creative, and emotional skills; their talents and passions; to explore their world and to see themselves as important stewards of their environment and future. We believe this can only be accomplished through conscious collaboration between classroom guides and parents. You have chosen to send your child to a Montessori program because we share the same outlook on the human soul and the same goals for your children – that with respect, love, time, and opportunity your child can develop their fullest potential to become a happy, confident, integrated adult – a part of a larger whole and a positive influence on the world. Parenthood is full of joy and worry, exhaustion and exhilaration, at times overwhelming responsibility and tedious, persistent stressors, and above all else a constant awareness of your child – their laughter and tears, needs, wants, and future! We hope to be a resource for you. Not only by providing a safe and nurturing place for your children to spend their days but also by being parent educators. We are specialists in child development, behavior, discipline, eating, sleeping, toileting. Please feel free to come to us with your questions, frustrations, insights, and ideas. We conduct Parent Education Nights for Infants, Toddler, and Preschoolers. We hold several Parent/Child events throughout the year so that the entire school can get to know one another and, again, share experiences and be resources for each other in terms of ideas, childcare, support. We encourage parents to attend the monthly Parent Coffee’s – occasions to have some adult time and conversation. Montessori of Alameda also takes very deliberate and conscious efforts to support our staff so that they may work at their fullest potentials. As all parents know, working with children requires the use of all of you faculties: physical strength and stamina, active and constant awareness, unconditional patience, and an unending stream of ideas. We are not working with inanimate objects etc. but little people at their most delicate phase of life. We are emotionally involved with the children in our classrooms and genuinely have their best interest at heart in everything we do. And not only in the classroom or this point in time but for their lives. Because children are influenced by everything they experience, the teachers are not only responsible for their “academic” learning or even models of behavior, but also examples of a trusting and positive outlook on life. As the teachers in the classrooms are the facilitators of the children’s self-construction they must be constantly working at improving themselves as educators and as models of grace and courtesy. Taking care of the classroom environment is very important to the overall philosophy. Thoroughly cleaning the classroom both daily and occasionally more intensely is a priority. We must take time regularly to record our observations of the children’s behavior, interests, and developing abilities. We must re-evaluate and re-organize the materials based on the children’s needs. This includes putting together, and in many cases, actually creating, new materials. We must plan an integrated curriculum for the upcoming weeks – materials on the shelves, daily art activities, a developing music curriculum, games and outdoor activities, cooking and gardening projects, etc. Collaboration with fellow teachers to gain insights and accumulate new ideas is very helpful. Teacher Planning Days are invaluable to achieving these goals. Developments in the field of Early Childhood Education as well as in the Montessori curriculum and implementation are being made daily. In order to both keep our ideas fresh and exciting for children and teachers as well as using the evolving understanding of child development in our curriculum, our staff is continuously educating themselves. Montessori of Alameda helps their staff continue their growth through the opportunity to attend workshops and conferences. This is achieved through both financial aid and time to attend these events. As our staff gains knowledge and experiences, they are ready to use them in new ways. Montessori of Alameda tries to grow in ways that provide opportunity for our teachers – more opportunities as lead teachers, teacher trainers, assistant directors, and specialists in music, art, parent education and consultation. And finally, just as parents need to take some time to renew themselves to be the best they can be, we feel it is important to give our teachers the opportunity to evaluate, renew, and take care of themselves as individuals. Only by doing this can we be completely present with your children in class. Resting, being with loved ones, enjoying a hobby or a sunny day, all bring about a sense of peace and fulfillment. These things provide humans with the opportunity to remember who they are and for us, the chance to remember why we have chosen the life we have, the work we have. We return to the classroom with a fresh perspective, new patience, many new ideas, and energy. In order to create consistency for the children, we refrain from taking personal time while classes are in session and instead wait for specific, pre-planned opportunities.